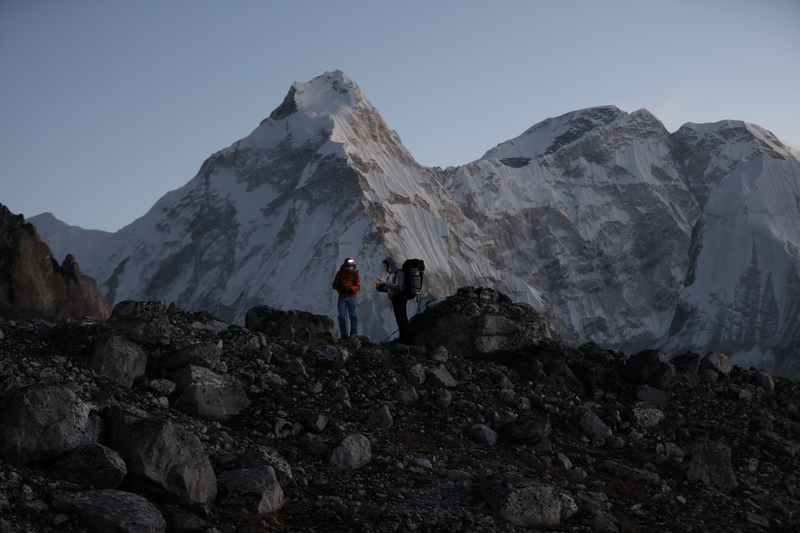 How did the idea of climbing Lunag Ri (6,907 m) in Nepal come about? To be honest, I don’t exactly remember what came first: The urge to travel to Nepal with my parents or the alpine project. In any case a mountaineer friend of mine, who had tried to climb the mountain himself, sent me some info and imagery of Lunag Ri, and pretty soon it was obvious to me: This is my mountain and I need to get there! What makes this mountain so special for you? On the one hand, the unique thing about Lunag Ri is, of course, that it’s an unclimbed peak. On the other, it isn’t just a high, snow-covered mountain that nobody’s been motivated enough to trudge up —it’s really challenging terrain. 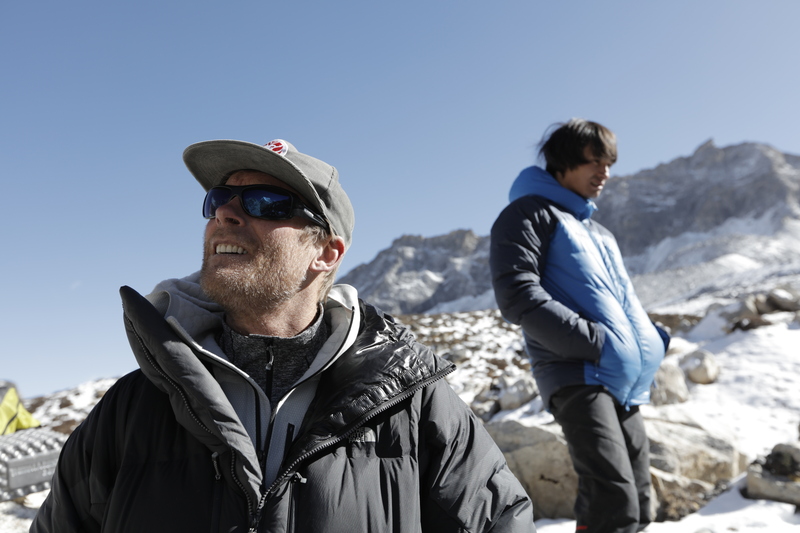 How come you joined forces with Conrad Anker for this expedition? You’re from different climbing generations. Conrad has done first ascents all over the world and I once got in touch with him for a couple of images of summits in Patagonia. And we both thought back then: “Hey! It would be great to do a tour together at some point!” In spring 2015 we travelled to Zion National Park and really got along right from the start. When you’re climbing with Conrad especially, you don’t really notice the difference in age. Describe the moment, just below the summit of Lunag Ri, when you realized that you wouldn’t be able to make it all the way to the top, because time was running out. It was a big mix of emotions. As a mountaineer you need to make your decisions as rationally as possible. But naturally there’s a certain amount of frustration when you fail. Nonetheless I believe that, all things considered, failure helps you mature. In retrospect you recognize the mistakes you made. For instance, we shouldn’t have left our bivouac gear behind when we went for a one-day push to the summit. We should’ve planned for one bivi on the way. I believe failure teaches you useful lessons for future adventures! All in all, Lunag Ri was just one part of your trip to Nepal. The other part was closely linked to your family’s history. In what way did the time spent with your parents make up for the “failure” on the mountain? (Laughs) I don’t think you can compare the two. But it was definitely a very important experience to travel to Nepal with my parents. Did you have a strong connection to Nepal as a kid? No, not really. The first time I was in Nepal was in 1993, when I was just three years old. The second time was in 1995 and the last time when I was nine. After that, school got more intense and of course the climbing progressed as well with championships and so on. Climbing really defined my journey. I always knew: This is what I want to be doing. In 1999 I did my first competitions and the climbing became a bigger part of my life— not only in my heart but also time-wise! Did your father tell you a lot about his home country Nepal? Of course he told me various stories—stuff like the perilous path he walked to school every day, but I was really focused on competition climbing. And besides that, I felt the need to distance myself a bit from his past to find my own path in life. Over the past few years I’ve started to feel drawn to Nepal—not only to climb mountains but also to spend time with my parents and get to know the Nepalese part of my family. You probably didn’t get a chance to get to know that part of the family before? That’s true! Not speaking Nepali is part of that. As a kid, I was never too interested in learning the language and my parents didn’t force it upon me either. Back in those days no one could foresee that I would one day have good use for it. But the last time I was in Nepal, after Lunag Ri, I went back to Nepal to try another mountain—I got to know other members of my Nepalese family and it worked out quite well—especially because one of my cousins lived in Austria for a while and speaks German very well. You can still learn the language. It’s never too late, right? (Laughs) It’s never too late! What can we Westerners learn from the Nepalese people? How we treat each other in everyday life! To not feel so stressed all the time … We all have a watch on our wrists, but in Nepal—at least in the countryside— they hardly ever check the time. You get up as the sun rises, or even a bit before that, and you go do your work. And ‘specially with the long distances between villages, which people walk day by day, there really is no rush and stress. Furthermore there’s this incredible hospitality. Despite having very little, next to nothing by our standards, the Nepalese happily share everything with you— that really is very inspirational! It’s often stated that your incredible climbing skills partly derive from your heritage. Did that annoy you when you were starting out? I wouldn’t say it annoyed me. But I think, my achievements are something I worked for very hard. And you mustn’t forget how incredibly supportive my parents have been. Once they drove from the South of France to Slovenia in one weekend to let me climb. They travelled a lot with me. When it comes to my mentality and attitude, they played an important part as well. As far as my genes go, I’m sure that one thing or another comes into play. For instance, I handle altitude extremely well and I can imagine that my Nepalese roots have a certain influence on that. How important is the prospect of a first ascent for you and what makes it especially appealing to you? The unknown! When you are somewhere on the wall as an alpinist, you always imagine yourself making your way up the wall and which line your route produces on the wall. The fewer lines there are on the wall, the less you fell encumbered and limited, and you feel free to choose your line. If someone has climbed it before you, you already know: Okay, this is possible and the person who came before me has made it anyway. There’s much less to explore! Exploring and discovering is something we all know from childhood. How did you manage to hold on to this childlike passion for exploration growing up? I don’t think that the wish to explore necessarily fades with age. I think it’s part of human nature and within each and every one of us—it just comes out in different ways. You don’t need to live this on the mountain. You can do it just as well in the city or in completely different aspects of life. I think it’s much more a matter of having the courage to live out that urge to explore at all. Isn’t it hard to endure the cold, solitude and low oxygen time after time? Don’t you need a lot of capacity to suffer? To me suffering is very much part of mountaineering, even a defining element of it. The urge to explore is just one side of it. But venturing into more extreme territory always raises the question: are you capable of enduring the hardship? I personally believe that you get to know yourself better by suffering than staying in your comfort zone. Do you deal with the risk of an accident or injury consciously or do you avoid thinking about those things? No, I really think about it long and hard! But you needn’t really talk about it with your climbing partners. You might talk about what to take along in the first aid kit with your partner, but in the end that’s usually the same stuff anyway. I can say for myself—and I think that’s what my partners do as well—that I think through very thoroughly what would happen if my partner broke a hand or a foot, fell off or fell unconscious on this or that section of the wall. Could you even cope chilling out on a beach holiday, laying in the sun or would you go insane by day two? (Laughs) I’ve started to surf a bit over the past few years—just because it’s the complete opposite of mountaineering. Every now and again it’s a great way to recharge my motivation for suffering on some distant mountain. But just slacking off on the beach—I don’t think I could stand it for two days, no. Do you have a big dream for the future, a true passion project? There is a project, that I’ve tried twice already and that still is a big dream of mine. It might be a bit less present at the moment than the other projects I’m doing next year. But it’s still the hardest thing I can imagine—the northeast face of Masherbrum in Pakistan. Will you return to Lunag Ri? Yes, of course! Conrad and I want to return to Lunag Ri around the same time next autumn. We haven’t put the final touches to our plans yet, but it’s definitely our plan. 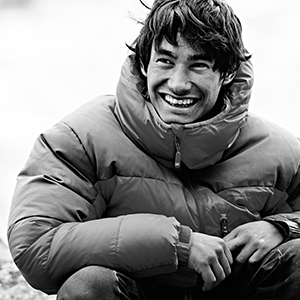 Born in Innsbruck to an Austrian mother and Nepalese father, the acclaimed climbing champion is drawn back to his roots in Nepal. The 26 year old plans new expeditions to Nepal, not just to face new alpine challenges but also to get to know his Nepalese family better.